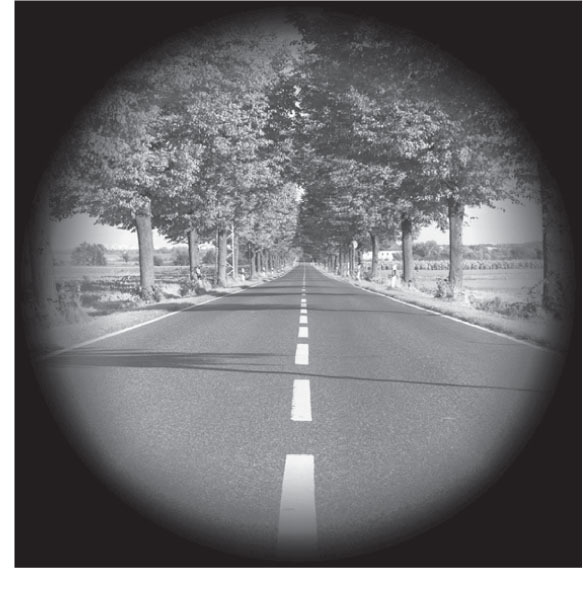 Glaucoma can cause a gradual “tunneling” of vision that often goes unnoticed until permanent sight loss occurs. By Cheryl L. Dejewski Glaucoma is a leading cause of blindness in the U.S., especially for African- Americans. In fact, black Americans have a 6-8 times higher risk of developing glaucoma than whites, and a recent study found that one in five black Americans age 75 and older has glaucoma. What exactly is glaucoma? It’s an eye disease that causes progressive damage to the optic nerve and is often related to fluid pressure in the eye. Left undetected and/ or untreated, glaucoma first causes loss of side vision and later can rob all of your sight. If you have diabetes or a relative with glaucoma, your risk of developing the disease greatly increases. And, once you have glaucoma, you’re more likely to suffer falls and car accidents as damage to your optic nerve leads to a “tunneling” of your vision. Glaucoma is known as the “sneak thief of sight” because the most common type is painless and progresses so slowly that most people don’t notice symptoms for years—until severe permanent damage has already occurred. How can you protect yourself from losing sight to glaucoma? The partners at Eye Care Specialists, an ophthalmology practice that focuses on educating and caring for Milwaukee’s African- American community, have an answer. They advise that you schedule regular eye exams to check for the disease and, if diagnosed, follow your doctor’s recommendations for scheduling laser treatment and/or using prescription medication eyedrops. They also suggest you read the following information regarding glaucoma diagnosis, risks and treatment. Ophthalmoscopy: An instrument called an “ophthalmoscope” is used to look into and light up the back of the eye to check the health of the retina and look for signs of glaucoma (like abnormal optic nerve size and loss of pink coloring). For the best view inside, the pupils are dilated. Tonometry (pressure) testing: Measures inner eye pressure by determining how much pressure is necessary to cause a slight indentation on the outer part of the eye. This is done either by directing a warm puff of air at the eye or painlessly touching it with what is called a “tonometer.” Normal pressure readings range from 12-21, but can vary by hour and day. Visual field testing: During this test, the patient stares into a machine and presses a button when they see flashes of light. A computer then plots a computerized “map” of the range of sight based on what areas have been lost. 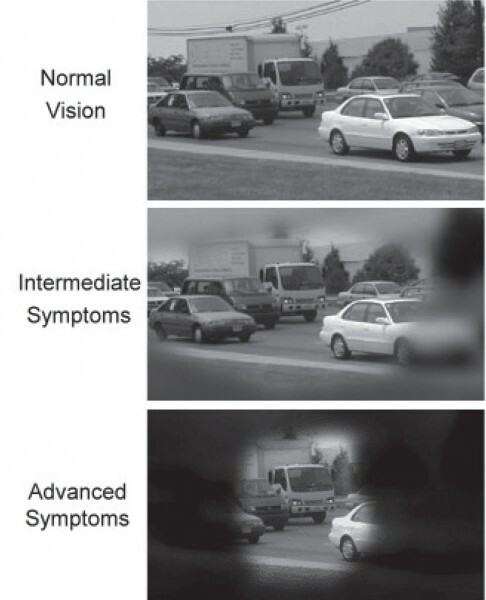 Loss of side vision is a common sign of glaucoma. Gonioscopy: A special hand-held contact lens with a mirror inside is used to examine the angle where the iris meets the cornea. This helps determine the type of glaucoma and treatment plan. Optical coherence tomography (OCT) testing: Eye Care Specialists joins Harvard Medical School and other prestigious institutions in offering this advancement. Patients focus on a dot while a safe, invisible laser light scans the inside of the eye. The OCT then creates detailed printouts (similar to CT scans) that visualize and measure any changes to the optic nerve and retina (an area smaller than the head of a pin)—often before damage occurs. If glaucoma is detected, we can treat it with drops, laser therapy or surgery. Follow-up scans are used to watch for changes and prevent future vision loss. Staff and patients love that the OCT is fast and painless and results aren’t influenced by attention span, comfort, or ability to follow directions. • Glaucoma is most common in adults over age 40, and the risk increases with each decade. Regular screenings should start at this time. • Ethnicity affects your risk rate. If you are black, you have a 6-8 times higher risk of going blind from glaucoma than a white person. Hispanics and Asians also have a higher risk rate than Caucasians. •Other risk factors include nearsightedness, diabetes (doubles the risk of glaucoma), steroid use, and having a previous eye injury. • Prompt diagnosis and treatment are vital to protecting and preserving vision. Encourage your siblings and other family members to be checked for glaucoma, especially if one of you has the disease. If any of you do not have an eye care specialist, you can call 414-321-7035 for a free educational booklet on the disease and information about scheduling a comprehensive screening that includes ophthalmoscopy, tonometry (pressure), visual field, gonioscopy, and OCT laser scan testing. This screening is typically covered by Medicare and most insurances. You’ll be helping your family to see life to the fullest . . . now and in the future. Dr. Freedman: Glaucoma can’t be cured, but treatment can usually halt further damage. The most common type of glaucoma is a lifelong condition that requires continual management. To prevent vision loss, we prescribe drops to lower pressure by either decreasing fluid production in or increasing fluid drainage out of the eye. Is there an alternative to drops? Dr. Paskowitz: In some cases, when drops alone cannot control the pressure, or side effects are intolerable, or multiple types of drops are required, laser treatment may be an alternative, including LTP & SLT (which increase fluid drainage) and ECP (which decreases fluid production) procedures. All take less than 10 minutes at our surgery center and are covered by Medicare and most insurances. How safe are laser procedures? Dr. Freedman: LTP, SLT & ECP have very good success rates for controlling glaucoma and reducing the need for drops or surgery. They also have lower complication rates than other glaucoma surgeries and can sometimes be repeated, as needed. What are the major benefits? Dr. Paskowitz: If laser treatment achieves steady normal pressures, it can reduce two huge burdens— cost and compliance. This is especially important for people who already have other conditions requiring daily medication(s) that they have to worry about buying and taking. Who qualifies for laser therapy? Dr. Freedman: Candidacy depends on your specific condition and must be discussed with your eye care specialist. In rare cases when patients are unable to have or don’t respond to laser treatment, traditional surgical procedures may be required. Our practice also offers new advanced procedures that use special implant devices to drain fluid and reduce pressure. Eye Care Specialists’ doctors are dedicated to the diagnosis and treatment of cataracts, glaucoma, diabetic eye disease, and macular degeneration. They frequently lecture to the public and fellow physicians and have written their own series of booklets on these conditions. Call 414-321-7035 for FREE copies or to schedule an appointment for a thorough eye screening (usually covered by insurance or Medicare) at their offices on 7th & Wisconsin Avenue, Mayfair Road across from the mall, or 102nd & National. They also offer information at www.eyecarespecialists. net.